Arm Band Badge Holders guarantee trouble-free wear with instant visibility and long-lasting durability. 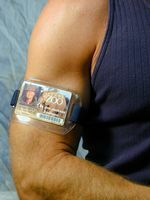 Arm band badge holders are required in many active work situations. Arm band badge holders are ideally suited to prominently display ID badges while maintaining a safe working environment. Using a clear vinyl arm band badge holder is the perfect solution for assembly lines, warehouses, outdoor occupations, recreational facilities, airports and many other specialized work environments. The arm band holder design keeps your ID credential from interfering with your work. Arm Bands - solid color 17" (432mm) adjustable elastic, adjustment range: 6 " - 10 ", stretches to 17". The arm band can be adjusted with one hand, without the need to remove it from your arm. Available in 6 colors. Day-glo colors are also available - call for details. All holders come priced with holder and armband as a complete unit!